Made in USA for 23+ years! Many modes of operation, indoor or outdoor applications and ease of maintenance and repairs. Trusted brand for years and years by thousands of customers. 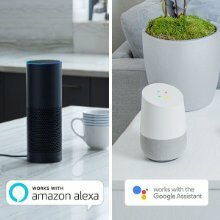 See how Google example works for a customer if wanting to use voice activation. If you don't mind a blemish here and there like a scratch/nick that you may not even notice, this is a great buy. This brand new Super Feeder carries the same 1-year warranty, excluding of course any blemishes. If showing out of stock, check back from time to time. 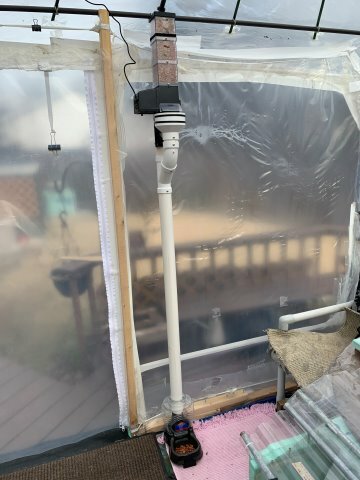 This basic package comes with a power adapter (type may vary) with 6' cord and jack plug, metal black powder-coat mounting bracket and strap, other hardware, two 2-cup capacity clear extensions, which give the feeder a total capacity of 1 quart and 3/4 cup. INCREASE ITS CAPACITY NOW OR LATER WITH THE 1.5 GALLON HOPPER AVAILABLE SEPARATELY. All you will need to operate it is any plug-in lamp/appliance timer (analog or digital), home automation system, etc...You MUST mount it to a 2x4 stud, 4x4, hang it, or make your own wood mount/platform (NOT for free-standing). 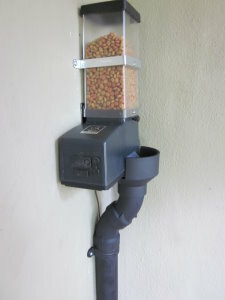 This feeder will feed from a few food bits to a cup or more many times per day. The frequency of daily feeding cycles is totally dependent on the amount of "on-off" cycles your remote timer has. If installed outdoors, it should be properly protected against wild animals and its power supply should be enclosed out of the weather. The quantity is adjustable at the feeder. 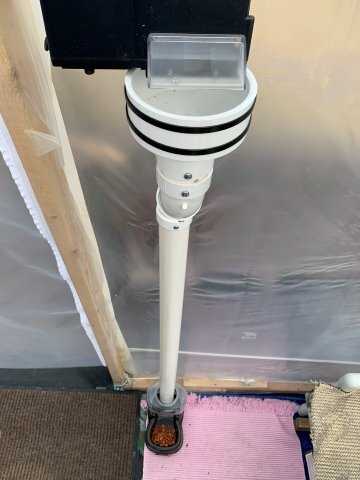 It's brand-new, but remember that although plastic on feeder and/or accessories may have some imperfections, proper operation is not affected and covered under warranty. Feeder may consist of early or late model housing and chute cover depending on what is in stock at time of order. Voltage required: Power supply (included) 110-240VAC 50-60Hz 12VDC output, USA style plugs only-not battery operated. If a 120V power source is not available, you may even use any of our 6-24V timers listed here to use your own low voltage power source (some wiring required). The feeder, as is, must be appropriately protected from wild animals if installed outdoors! Examples can be found at super-feed.com by clicking on http://www.super-feed.com/small.html. Purchased this feeder for use at our cabin. My two cats have used this model at home for several years, and the operation has been flawless. Without the automatic feeder, the cats were always begging for food and free feeding is not an option because of a weight issue in one of the cats. Portion control is excellent with this feeder. The cats receive 3 small feedings and additional wet food once or twice daily so they are happy. When a petsitter is needed, they can come only once daily. As fantastic now as it was 5 years ago! I bought this model to go along with other feeders I bought about 5 years ago, because we get a new cat and they don't like sharing. Although it is marked (and discounted) as "blemished" I couldn't see why. It looks great, and works great! My cats haven't ever been able to game these machines, and I never have to worry about reliability. It's super sturdy and easy to set up, and my cats dont bother me all day long for extras because I'm not the food source anymore! If you are on the fence at all, go for it! It's the best product I have ever bought in my life, no exaggeration. First Time Great Deal, Second Time Even Better ! Great product. Worth every penny!!! I was a little skeptical at first because of the price. My wife and travel a lot so we needed something to feed our outdoor cat when we were away. 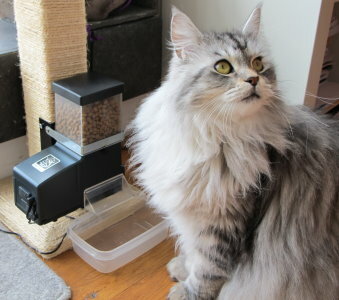 I purchased the Cat feeder in December 2011. I built a wooden enclosure and has been outdoors from day one. I live in Southern Michigan so it sees temperatures from -10F to 100F. It is still working excellent to this day. I highly recommend this feeder to anyone that is looking for a high quality feeder that will last. 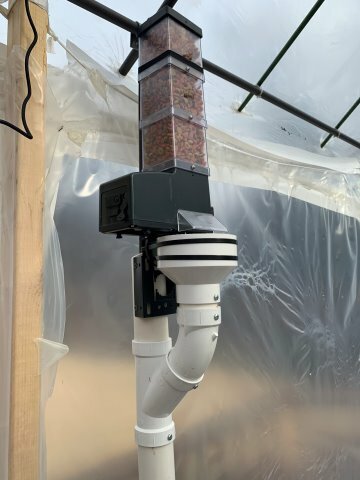 If you use these feeders outdoors you will have to adjust the volume adjustment screw differently in summer and winter to get the same amount of food per activation. I think the plastic inside is softer with warm temperatures so it allows more food to flow out when it is warmer outside. This feeder was purchased to give our original feeder a rest. We are campers and knowing the guys are being fed takes the stress away. Finally a good automatic food dispenser! I tried different models of food dispensers and they don'T last or don't work as advertised.... till now! Superfeeder is very good. I installed my 2 machines (have 2 cats and they don't share!) in minutes. Works great as advertised. Very compact units and seem very robust and durable. Only downside is the adjustments. The time knob would be nice if it had a more precise mesure than turning half turn each time! Also a graduated width adjustment for the pellets. Since I have 2 machines would have been easier to configure the same! I recommend this product to every pet ownwers. PS: Very good customer service and email response time. My wife and I breed show rabbits. They are kept on a pretty strict feeding schedule so that they are in top shape. We attach these units over the J feeders on each cage. We have digital timers for each rabbit so we can take care of their individual needs. Even though rabbits generally spook pretty easy, mine came to the feeders after the auto feeder stopped and ate normally. We plan to use these units for nights when we are out past the regular feeding time or for weekend trips. Will be buying a nanny cam so I can see the feeders working. Definitely recommend them, they worked like a charm. A great product. Cat proof. you have full control of how often and how much food is dispensed, unlike other feeders. worth the price.